The Duchess of Cambridge, Kate Middleton, also known as Princess Kate, has entered a London hospital in the early stages of labor. This is really big news in England. The media has been camped outside the hospital for days. Following tradition, after the baby is born, a notice with details will be posted on the easel pictured above. 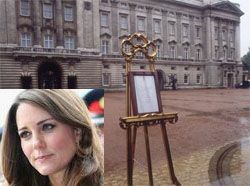 The formal announcement that a baby has been born will be made in a statement driven by car from the hospital across London and posted on an easel in the grounds of Buckingham Palace.